I'm a coworker of Wayne's and I would like to offer my condolences to his family and to his many friends. Wayne is one of the few managers I've ever had the pleasure to work with that was genuinely approachable. We've had many discussions together, from rockets to green houses and from product structure to production releases of new products. He was instrumental in my development here at MagTek and I will miss the cubicle meetings we always seem to have. I'm very greatful that I had a chance to work with him, I just regret never having see one of his rockets shoot up to the sky or the fact I will never have a chance to consult with him again. Hey Wayne... You've made your final launch and your arriving at a better place. You have it easy now, no more running out to retrieve your rockets or having to monitor the temperature or humidity levels of your green house. Everything is in it's place and at the right place, take care my friend! God speed Wayne ,...God speed . You will be missed . I had the privilege of being a co-worker with Wayne for almost 20 years, and I still can't believe that he is gone. I extend my sincere condolences and prayers to all of Wayne's family and friends. Based on the comments in this guestbook, I can see that his friends in the rocket community have the same respect and appreciation for Wayne as do his co-workers at MagTek. He always treated his co-workers with respect, and was always willing to reach out to others to assist them in finding solutions. In his laid back, quiet, and unassuming way, he bettered the lives of those who knew him, and did so purely out of a sincere desire to help others. 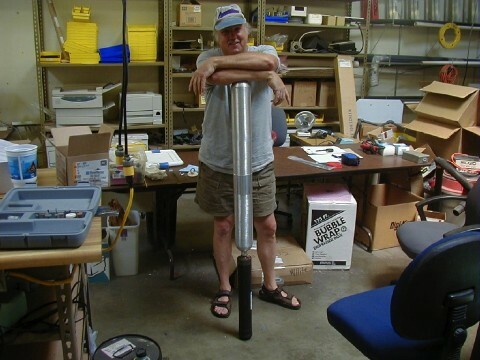 I appreciate getting to see all of the pictures of Wayne working on his rocket projects, because it really demonstrates that Wayne was always an "engineer and innovator at heart". He also possessed an uncanny ability and desire to find the ultimate efficiency in everything he worked on. In both, he also demonstrated the same friendship and ability to help others! Wayne Mrazek was a good man, a good friend, and will be missed deeply by all that knew him. Wayne was a very nice person to deal with. motors were first test flown by Wayne. He was the main guy for beta testing. will be dedicated to Wayne. This news has come to a blow to Colin and myself. Other than the chap we used to buy all our Rattworks stuff from for peeps over here in the UK, he was also a key bloke for us in supplying, amongst other things, Ground support equipment for many of the big projects we have done for television and film over here in the United Kingdom, such as the Reliant Robin Space Shuttle and others yet to be screened. It was Wayne who was the guy I first started talking to a few years ago when I started out on my hybrid journey, he was a practical bloke who for one, I thoroughly enjoyed talking to. He was practical knowledgeable and a thoroughly reliable man. Given the lack of hybrid expertise over here in the UK, Wayne was a key person in passing knowledge to us. More recently it was good banter and fun dealing with Wayne. Although we never had the pleasure of meeting in person, he was a familiar voice on the end of the telephone or a sensible script at the end of E-mail. For me he was also a HUGE knowledge base for practical hybrid flying. There is a huge difference between talking the talk and walking the talk in flying hybrid rockets. Wayne walked and talked it! He did it in a modest and pleasant way from what I saw. Hearing this news has come as a huge shock. Colin and I will miss him over here in the UK. Please pass on our condolences to his family from us two over here in Great Britain. Damian Hall and Colin Rowe. I spent a lot of time with Wayne for the last 8 years, but after moving to Texas it was hard to see him other than at LDRS and BALLS. I will miss him very much. My condolences to Wayne's family. Two years ago my son Dylan and I decided to try Hybrid rockets motors. Wayne was there for us every step of the way. He was so patient showing us how it all worked. He was honest and fair with all of our purchases. If it didn't work he replaced it. If we were missing a small part he would gladly give us one. When I emailed him I always heard back promptly. He was our Hybrid mentor. He was good and kind man. Wayne will be missed by all of us. I have known Wayne for last 15 years. Wayne was always patient, always helpful, and he was always on top of things at work. I met him during my last visit to Carson. I will miss meeting him whenever I will be visiting MagTek. Our thoughts and best wishes are with his family. We will always miss him.